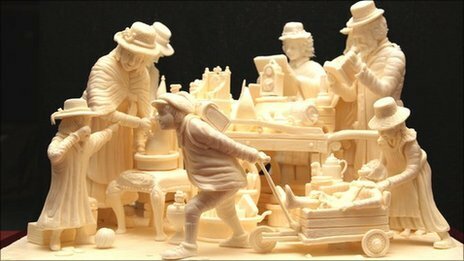 A prize-winning "street" made out of pastry margarine by a Leicester artist has gone on display at a museum. Last November, Vipula Athukorale, 47, won a gold medal for his unusual Victorian street scene at a world food sculpting competition in Luxembourg. The 40kg (88lb) artwork, which took one month to complete, will be on show at Belgrave Hall Museum until 16 July. Mr Athukorale said the sculpture, kept at his Belgrave home since the win, is "purely for public enjoyment". The piece is based on a Ronald Embleton painting which depicts a street scene with nine different characters. Clare Hudson, from Creative Leicestershire, approached the artist about his "unique" sculptures. She said people were "highly intrigued" about his pieces. "His work is so hard to describe, so we thought the best thing would be to display it publicly," she said. "He works freehand and he has an amazing eye and technique." Mr Athukorale said: "We thought if we don't show it to the public then it was a waste. "I really want people to enjoy my work." The artist has an array of other margarine sculptures at his home, including a foot-long Rolls Royce car complete with four passengers travelling to a wedding. Mr Athukorale beat contenders from more than 50 countries to win the top prize at the International Culinary World Cup. The sculptor said he hoped to win more medals at other world events with his next unusual artwork.